A new survey from Abacus Data finds that only a slight majority (52%) of Canadians from outside Quebec would vote to keep Quebec in Confederation if they were faced with a referendum. One in four would vote to remove Quebec from the country while 22% were unsure of how they would vote. Moreover, a majority of Canadians outside of Quebec (61%) said they strongly opposed to giving more federal funding, powers, or special status to Quebec to keep them in Canadian Confederation. When asked how they would vote if there was a referendum on the future of Quebec in Confederation over half (52%) of Canadians from outside Quebec said they would vote to keep Quebec in Confederation. 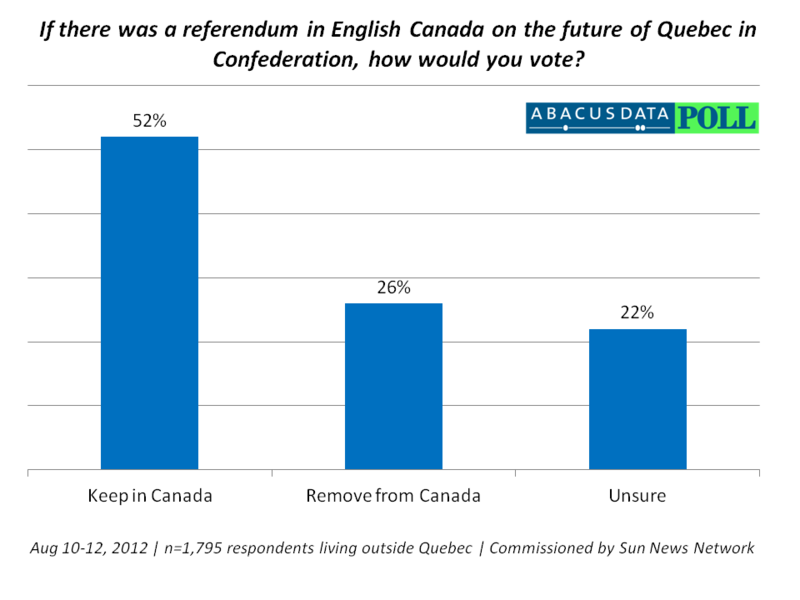 Just over a quarter (26%) said they would vote to remove Quebec from Confederation. 22% of Canadians said they were unsure how they would vote if there was a referendum. Canadians outside of Quebec who voted for the Liberal Party of Canada in the last federal election were more likely to support keeping Quebec in Confederation (70%), compared to those who voted for the Conservative Party of Canada, 48% said they would vote to keep Quebec in Confederation. Young Canadians, those 18 – 29 were most likely to say that they were unsure how they would vote if faced with this question. While a majority of Canadians outside of Quebec would vote to keep Quebec in Confederation, Canadians outside Quebec strongly supported provincial equality and opposed the federal government giving Quebec special treatment to keep the province in the country. Respondents were shown two statements regarding special considerations for Quebec and asked to choose the statement that was closest to their view. Those who voted for the Conservative Party in the last federal election were most likely to support provincial equality (96%) while young Canadians, those aged 18 – 29, were more likely to support the federal government in doing all that it can to keep Quebec part of Canada. 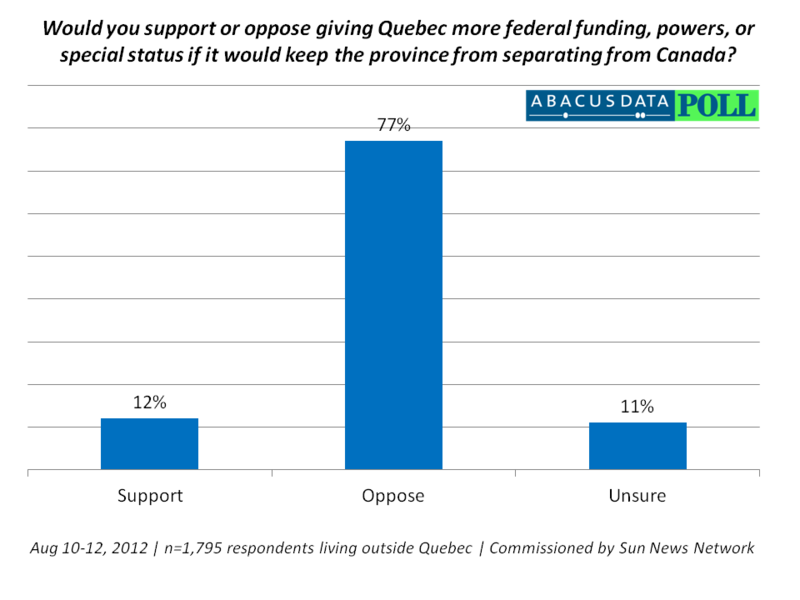 A majority of Canadians surveyed (61%) were either strongly or somewhat opposed to giving Quebec more federal funding, powers, or special status in order to keep the province from separating from Canada. In contrast, 12% said they would either somewhat or strongly support providing Quebec with special status, powers, or funding to keep them as part of Canada. Conservative Party supporters were the least likely to support special considerations to keep Quebec in Confederation. Liberal Party and Green Party supporters were most likely to support special considerations. Support was high among young Canadians, 19% said they support special status for Quebec where only 5% of those 60 years of age and older would support special considerations to keep Quebec from separating from Canada. With Quebec looking likely to elect a separatist PQ provincial government, a large number Canadians outside of Quebec are ready to throw Quebec out of the country. Although a slight majority of non-Quebecers cannot envision a Canada without Quebec, about one in four admitted they would vote to remove Quebec from Confederation while another 22% were unsure about how they would vote. Despite the division on how they would vote in a referendum, most Canadians outside Quebec do not support any special treatment for Quebec with over eight in ten believing in provincial equality. These results demonstrate the potential problems for the federal government if the PQ were to win the Quebec election. While the provincial government will be demanding more powers and autonomy, Canadians outside Quebec are likely to be opposed to any moves to placate Quebec. Intense Quebec-Rest of Canada political conflict may once again be around the corner. In June, we asked non-Quebecers what they thought about Quebec. This month’s results aren’t that surprising when we consider those results. The survey was conducted online with 1,795 respondents living outside of Quebec in English using an internet survey platform. A random sample of panelists was invited to participate in the survey from a larger internet representative panel of over 150,000 Canadians. The survey was completed from August 10-12, 2012. Since the online survey was not a random, probability based sample, a margin of error could not be calculated. The margin of error for a survey of 1,795 respondents using a probability sample is +/- 2.4%, 19 times out of 20.